One of the chief delights for me in joining Facebook has been meeting and becoming friends with so many interesting people – some of whom, moreover, are gifted with the most extraordinary and wonderful talents. 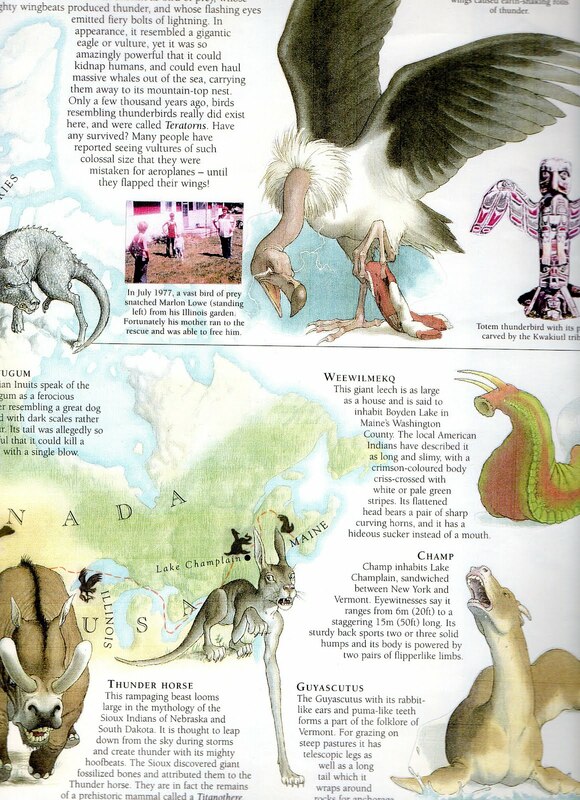 One such person is Andrew Scott from Vancouver in British Columbia, Canada, whose ability to manufacture astonishingly life-like models of real and imaginary animals is truly breathtaking. Using acrylic on PVC gel and iron wire or copper and aluminium for many of them, each of his numerous sculptures has been skilfully created by him with meticulous attention to detail, and the result is never less than mesmerising. Now, with Andrew's kind permission, I am delighted to be able to present here an exclusive ShukerNature showcase of his spectacular work – a unique imaginarium of wonders, marvels, and terrors the likes of which you will never have seen before nor are likely ever to see again. So sit back, eyes at the ready, and prepare to be amazed! 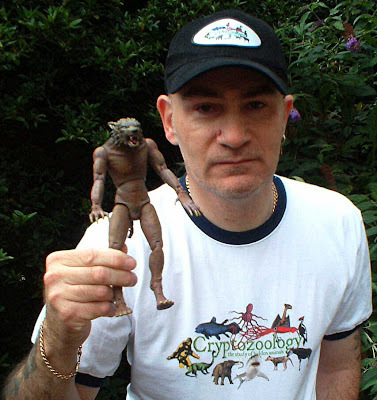 Needless to say, as a cryptozoologist I am particularly fascinated by Andrew's eclectic assortment of mystery and imaginary beasts – a wholly original museum of unnatural history, in fact, whose specimens' decidedly strange, even alienesque features are guaranteed to delight and disturb in equal measure! 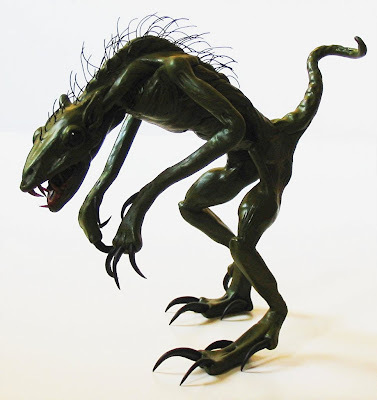 One of my personal favourites from Andrew's menagerie of crypto-models is his Zeuglodon – an evolved, present-day version of which is a popular identity among cryptozoologists for various elongate lake and sea monsters. Another crypto-celebrity produced in model form by Andrew, utilising acrylic and foam rubber, is the giant squid. Andrew has yet to prepare a Mongolian death worm (though he has plans to do so), but he has already produced something comparable, which he refers to as a Sand Worm. As can be seen here, it is armed with a cluster of tentacles at its anterior end, plus a triangle of tiny ocelli (eye-spots) on top of its head and an additional pair sited laterally. It is this minute degree of detail present in all of Andrew's works that I find so captivating, from both a purely aesthetic and a strictly scientific viewpoint. Andrew's Chupacabra is not for the faint-hearted. A terrifying bristle-backed biped armed with formidable talons and sizeable fangs, there is no doubt that this green-skinned, hunch-backed horror would strike fear into the heart of anything that it encountered, and provide years of nightmares for anything that survived such an encounter. Warning: This section contains slimy tentacles – lots of them!! 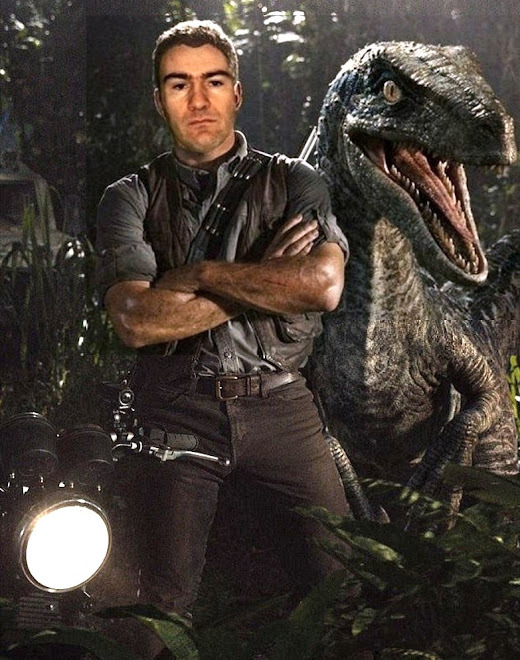 It is perhaps with Nature's nightmarish side that Andrew really comes into his own, permitting his imagination to wander down the darker paths and byways of evolution to conjure forth an array of overtly bizarre and sometimes physically shocking life-forms, yet invariably executed with exemplary showmanship flair and expert structural insight. Take, for instance, the Swamp Critter. Dramatically dissimilar from anything within Earth's catalogue of known, modern-day organisms, it vaguely resembles something called into being from the archaic Burgess Shale ecosystem present at the onset of life on our planet. 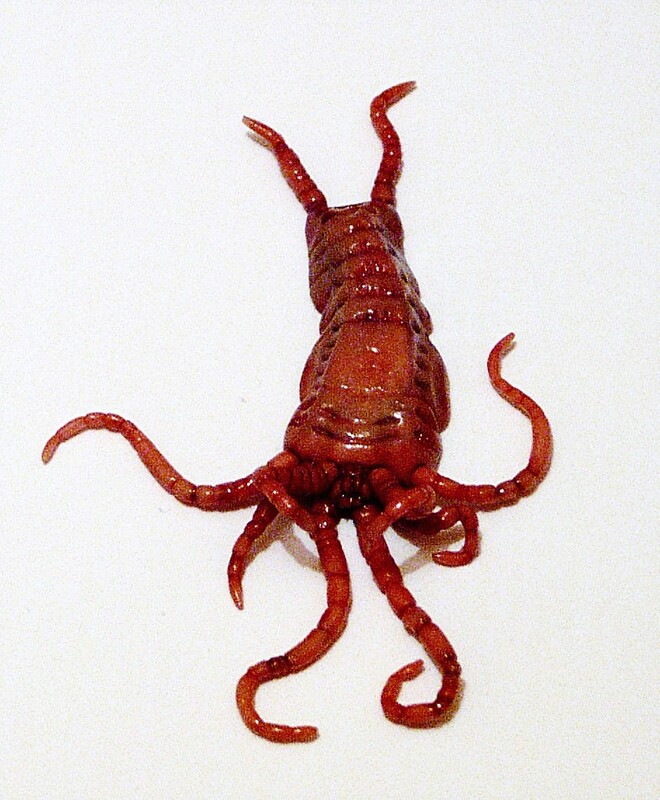 However, it is even stranger and decidedly more sinister – thanks in no small way to that conspicuously large, sharp-looking claw at the tip of its elongated body, its plethora of vermiform tentacles, and the unnerving ability of its anterior body portion to rear upwards, rather like a cobra about to strike. No less settling to the mind is what Andrew terms the Baby Deep One, because this is his concept of what H.P. 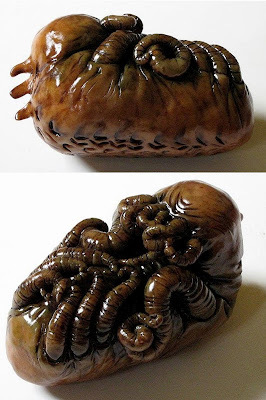 Lovecraft's Deep Ones looked like as infants. Dorsally, it resembles a curled, gelatinous larva with little in the way of distinguishing features other than three short projections borne upon what appears to be this bizarre entity's neck region, and a pattern of short ridges running down its back. Turn it over, however, and you are met with a writhing mass of slimy tentacles, resembling a host of twisting, intertwined worms coated in glistening mucus. As with all of Andrew's sculptures, the technical accomplishment is dazzling – even the creature's slime looks ready to drip off its tentacles at any moment. Click here to discover how Baby Deep One was created by Andrew. Yet another of Andrew's beasts supplied with a plenitude of tentacles is the Crawler. Dorsally, its crenulated external surface recalls that of a woodlouse, but ventrally its tentacles betray a very different zoological identity and origin. Ocelli and tentacles are trademarks of Andrew's zoological design, and both figure extensively in Beasty, together with a vicious-looking pair of lateral jaws. Even more impressive, however, are the huge jaws of the Crazy Critter (in reality a purchased pair of genuine wolf-eel jaws), which otherwise resembles a centipede, but with tentacles instead of legs. In the Sand Creature, the ocelli have been replaced by fully-fledged eyes, and the tentacles are arranged in lateral clumps. As for Baby: well, it has certainly never been more true that only a mother could love it! Armed with Andrew's customary abundance of tentacles, a jutting lower jaw brimming with teeth, and a long tail, this globular grotesque is definitely NOT pretty in pink (but readily emphasises the sick in cyclamen), and calls to mind a cryptozoological Eraserhead. In fact, Baby was indeed designed by Andrew specifically for a horror film, but sadly the film was never completed. Remember those disgusting little wingless insects known as silverfish that sometimes turn up in fire grates, kitchens, or bathrooms? Imagine if one of them mutated, growing larger in size, turning a lurid pink in colour, and seeking out a more intimate dwelling place – the human brain? If that pleasant little thought hasn't already given you nightmares, here's Andrew's brainworm! 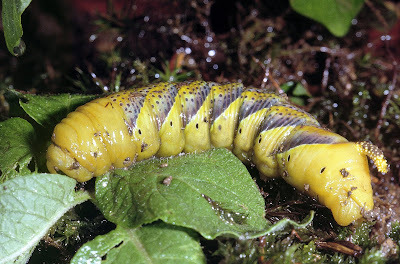 And don't even get me started on his Triloslug and his Martian Maggot – the latter is clearly one for the exobiologists. Two more weirdly wonderful creations designed as ever with Andrew's painstaking care and precision – as is the wonderfully-named Sea Pineapple of Death. This vaguely squid-like marine organism with a pineapple-redolent body sports a ring of eyes encircling its head, and two threesomes of tentacles - one set long, the other set short. Not all of Andrew's creations are of Earth origin, as exemplified not only by his Martian Maggot but also by his Alien Embryo. Tentacles, as ever, are liberally supplied, but it is difficult to speculate what this entity may ultimately become – which is perhaps no bad thing, especially for those of a nervous disposition! British geneticist Prof. J.B.S. Haldane is best-remembered outside genetics for his oft-quoted reply when once asked what inferences could be drawn about the nature of God from a study of His works: "An inordinate fondness for beetles". A study of Andrew's models would suggest that he shares a similar degree of fondness for such insects, as his collection includes a wide range of beetles. Furthermore, so true to life are they that had I not already known them to be models, looking at their pictures I would have assumed that I was viewing examples of macro-photography featuring bona fide beetles. Similarly, the exceptional degree of verisimilitude exhibited by this model makes it very easy to forget that this really is 'just' a sculpture and not a genuine earwig, ready to scuttle away at any moment. 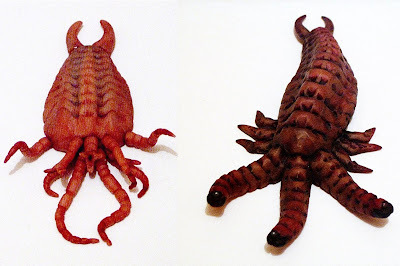 Andrew also has a passion for trilobites, and again he has produced models of several different types. The following example, belonging to the species Bristolia bristolensis, is particularly eyecatching. As varied and as numerous as they are, the examples presented here are just a small selection of Andrew's prodigious output of models and sculptures, which readily convey the vast scope, expertise, and inventiveness of the mind and imagination that created them. 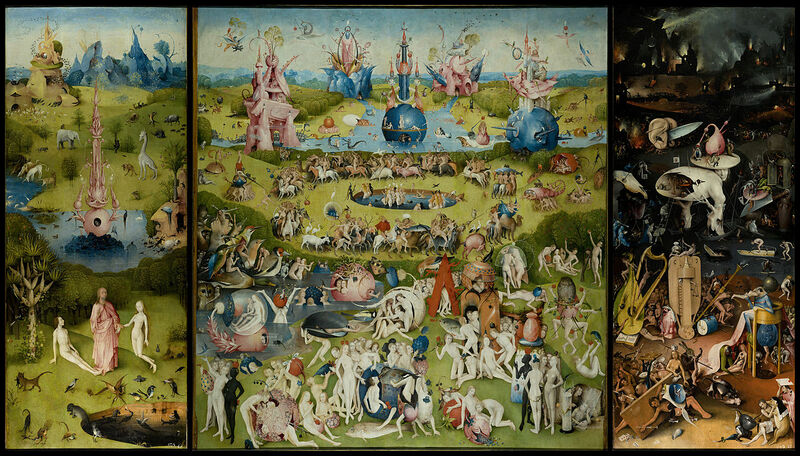 One of his models drew a comment from a viewer who compared Andrew to the celebrated Dutch artist Hieronymus Bosch (c.1450-1516) – famed for his extraordinary triptych painting 'The Garden of Earthly Delights', which is filled with fantastic figures and beasts. 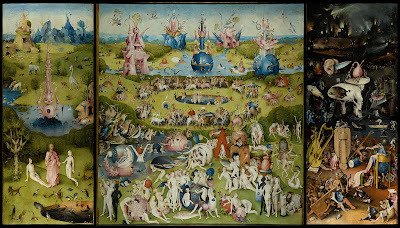 To my mind, this is a valid comparison, because Andrew's creations demonstrate a breadth and depth of vision so profound and proliferate that just as Dr Bernard Heuvelmans was called the Sherlock Holmes of cryptozoology, it would be no exaggeration to call Andrew Scott the Hieronymus Bosch of (un)natural history. Andrew recently mentioned to me that he will be attempting a model of the Mongolian death worm, a cryptid famed for its alleged powers of electrocution. Consequently, I now await this with keen delight, albeit with a degree of trepidation too. 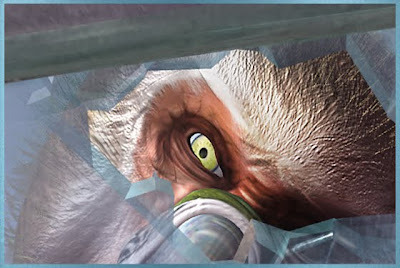 For if Andrew's death worm is (as it surely will be) as realistic as all of his other animal models, it may prove to be a shocking experience – in every sense! IMPORTANT: The copyright of all photographs included in this ShukerNature blog post belong to Andrew Scott, and these photographs must not be reproduced without his written permission. 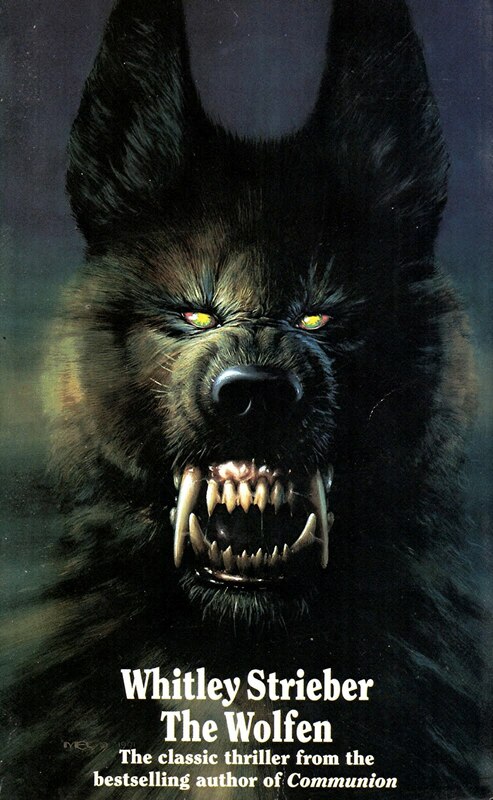 One of the most unusual examples of the werewolf movie genre was the film 'Wolfen' (1981), based upon the novel The Wolfen (1978) by Whitley Strieber. 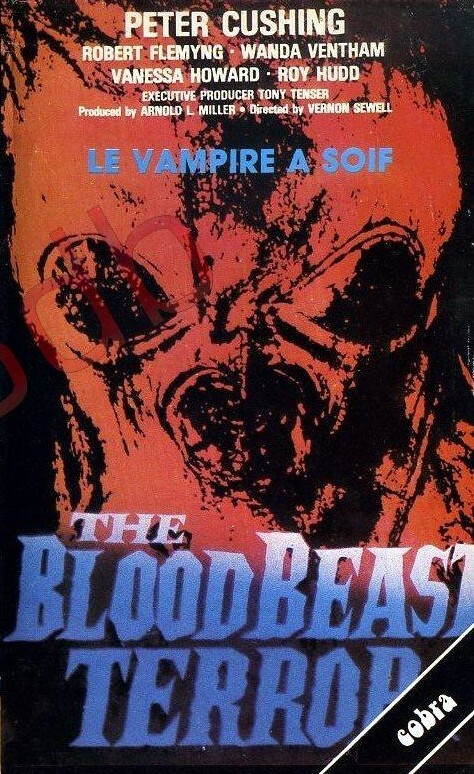 Albert Finney starred as a Manhattan detective searching for a mysterious, elusive, and exceedingly intelligent species of highly-evolved humanoid wolf, which has been preying upon humans from the earliest times and is responsible for the werewolf legends but has never been revealed by science. Of course, wolfen are wholly fictional...aren't they? 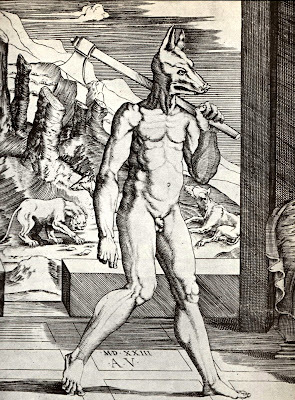 Similarly, world mythology is amply supplied with wolf-headed humans or wolf-men. These include ancient Egypt's jackal-headed god of the dead, Anubis; the evil Thessaly-originating king of Arcadia, Lycaon, transformed into a wolf by Zeus but often portrayed as a wolf-headed man; the cynocephali of India; and even St Christopher, frequently depicted as a dog-headed human. Moreover, the British Isles is famously rich in fabulous monsters, one of which is the wulver - a reclusive wolf-headed humanoid from Shetland mythology, which is covered in short brown hair, lives in caves dug out of steep hills, and enjoys fishing. Once again, however, wulvers are entirely legendary...or are they? 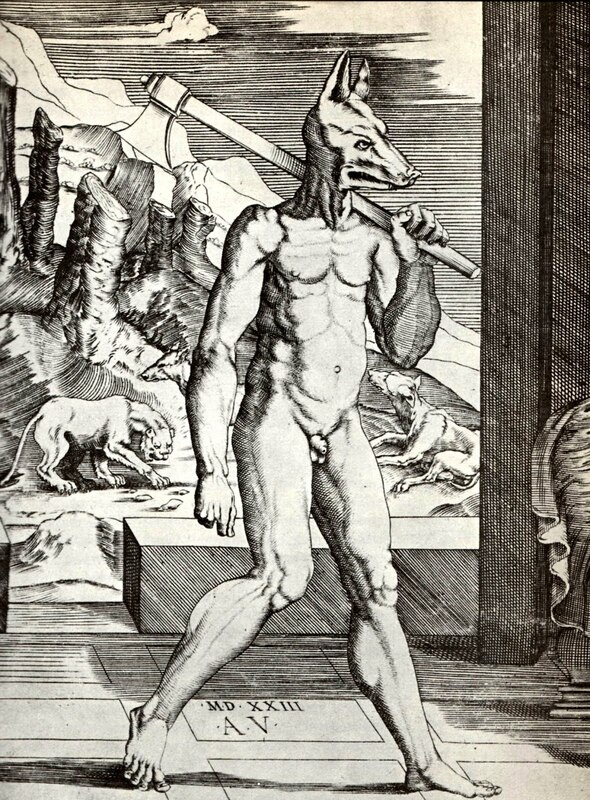 There is an unsettling number of reports on file describing reputedly authentic encounters with wolf-men. These include the following pair of spine-chilling incidents, each featuring an extraordinary skull and the even more extraordinary events that followed its discovery. "I was about fifteen years of age at the time, and had for several years been residing with my grandfather, who was an elder in the Kirk [Church] of Scotland. 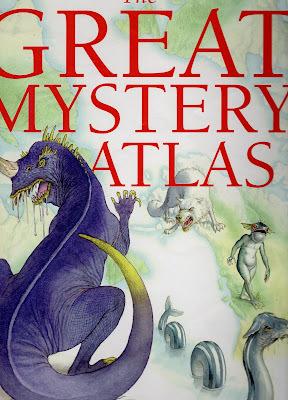 He was much interested in geology, and literally filled the house with fossils from the pits and caves round where we dwelt. One morning he came home in a great state of excitement, and made me go with him to look at some ancient remains he had found at the bottom of a dried-up tarn [lake]. 'Look!' he cried, bending down and pointing at them, 'here is a human skeleton with a wolf's head. What do you make of it?' I told him I did not know, but supposed it must be some kind of monstrosity. 'It's a werwolf[sic]! he rejoined, 'that's what it is. A werwolf! This island was once overrun with satyrs and werwolves! Help me carry it to the house.' I did as he bid me, and we placed it on the table in the back kitchen. That evening I was left alone in the house, my grandfather and the other members of the household having gone to the kirk. For some time I amused myself reading, and then, fancying I heard a noise in the back premises, I went into the kitchen. There was no one about, and becoming convinced that it could only have been a rat that had disturbed me, I sat on the table alongside the alleged remains of the werwolf, and waited to see if the noises would recommence. I was thus waiting in a listless sort of way, my back bent, my elbows on my knees, looking at the floor and thinking of nothing in particular, when there came a loud rat, tat, tat of knuckles on the window-pane. I immediately turned in the direction of the noise and encountered, to my alarm, a dark face looking in at me. At first dim and indistinct, it became more and more complete, until it developed into a very perfectly defined head of a wolf terminating in the neck of a human being. Though greatly shocked, my first act was to look in every direction for a possible reflection - but in vain. There was no light either without or within, other than that from the setting sun - nothing that could in any way have produced an illusion. I looked at the face and marked each feature intently. It was unmistakably a wolf's face, the jaws slightly distended; the lips wreathed in a savage snarl; the teeth sharp and white; the eyes light green; the ears pointed. The expression of the face was diabolically malignant, and as it gazed straight at me my horror was as intense as my wonder. This it seemed to notice, for a look of savage exultation crept into its eyes, and it raised one hand - a slender hand, like that of a woman, though with prodigiously long and curved finger-nails - menacingly, as if about to dash in the window-pane. Remembering what my grandfather had told me about evil spirits, I crossed myself; but as this had no effect, and I really feared the thing would get at me, I ran out of the kitchen and shut and locked the door, remaining in the hall till the family returned. My grandfather was much upset when I told him what had happened, and attributed my failure to make the spirit depart to my want of faith. Had he been there, he assured me, he would soon have got rid of it; but he nevertheless made me help him remove the bones from the kitchen, and we reinterred them in the very spot where we had found them, and where, for aught I know to the contrary, they still lie." Quite aside from its highly sensational storyline, it is rather difficult to take seriously any account featuring someone (Warren's grandfather) who seriously believed that the Hebrides were "...once overrun with satyrs and werwolves"! By comparison, and despite his youthful age, Warren's own assumption that the skeleton was that of a deformed human would seem eminently more sensible - at least until the remainder of his account is read. 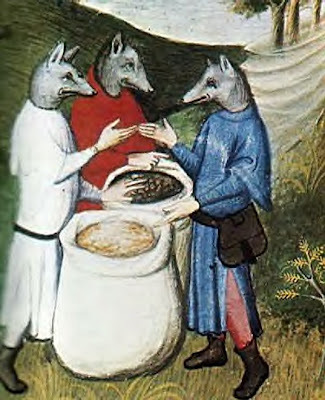 Notwithstanding Warren's claim that his account was factual, however, the arrival of what was presumably another of the deceased wolf-headed entity's kind, seeking the return of the skeleton to its original resting place, draws upon a common theme in traditional folklore and legend. 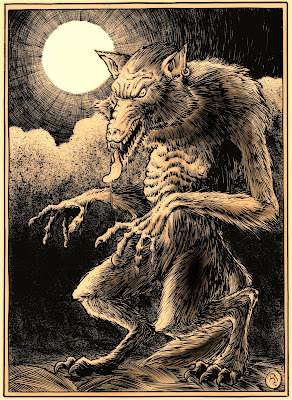 As documented in Werewolves (1933) by the Reverend Montague Summers, an authority on such entities, the second of the two bloodcurdling episodes to be considered here occurred in summer 1888, and featured a professor from Oxford who had rented a holiday cottage in a mountainous area of Merionethshire, Wales. During his stay there, the professor decided to go fishing one day in a local lake, and while doing so he hooked an unusual object that proved to be the skull of an extremely large dog-like beast. Curious to discover more about his unusual catch, he took the skull back to the cottage, but left it in the kitchen when he went out for the evening with a friend, leaving his wife alone in the cottage. While they were away, the professor's wife suddenly heard a strange snuffling sound outside the kitchen door, but when she went into the kitchen she saw to her horror the face of a terrifying red-eyed beast, seemingly part-human and part-wolf, outside the window, grasping the window ledge with paws that resembled hands. Greatly frightened, she ran back to the front door of the cottage and bolted it - just in time. Moments later, the monster was panting outside, and rattling the door's latch. Unable to open the door, it paced round and round the cottage, snarling and growling with rage as it vainly sought some way to enter, until eventually it departed, leaving the petrified woman shaking with fear inside. 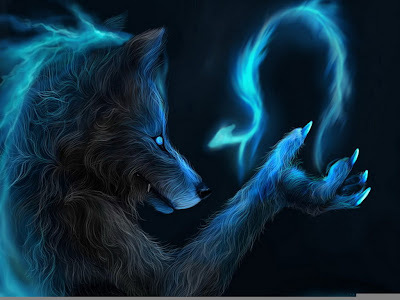 When her husband returned with their friend, they made absolutely sure that the house was totally secure, and then sat waiting with stout sticks and a gun at the ready, in case the wolf-man, werewolf, wulver, or whatever it was, returned - which it did. Later that same night, as the cottage lay enshrouded in a still darkness, its three alert occupants heard the soft crunching of paws upon the gravel outside, then the scratching of nails or claws against the kitchen window. And, to quote Summers, as they peered towards the sound: "...in a stale phosphorescent light they saw the hideous mask of a wolf with the eyes of a man glaring through the glass, eyes that were red with hellish rage". They raced to the door, but their quarry had heard them, and as they opened it they could just discern a huge form racing into the lake, and disappearing from view beneath the surface. There seemed only one way of bringing this living nightmare to a close. So as soon as it was light, the professor left the cottage, rowed out into the lake, and hurled the mysterious skull as far as possible into the lake's depths. Returning the skull from whence it had come evidently restored an equilibrium of sorts, because its semi-lupine seeker never returned. Coupled with its melodramatic storyline, this case's absence of names via which its details could be independently checked or pursued by other researchers does not bode well for its verisimilitude. Of course, it could be that the professor and the others did indeed exist but did not wish their identities to be made public - which, though perfectly understandable, is hardly beneficial in furthering the case's claims to authenticity. Even more worrying, however, is this case's profound similarity to the earlier one, documented by O'Donnell. In both histories, a large canine skull (one in isolation, the other attached to a human skeleton) is found in a lake (one still containing water, the other dried up), brought back to the finder's residence, and left there in the kitchen during the evening with only a single person in the house. This person is duly confronted at the kitchen window by a terrifying face and hand(s) - presumably a living representative of the skull's species (described in near-identical manner within the two histories) searching for it. Although the entity is ultimately frustrated, it has elicited sufficient fear for the skull's finder to return the skull to its place of discovery, after which the entity is not seen again. Yet even if we dismiss Summers's case as a piece of fiction inspired by O'Donnell's report, there are others still to account for, some of which are again included in O'Donnell's book and McEwan's. 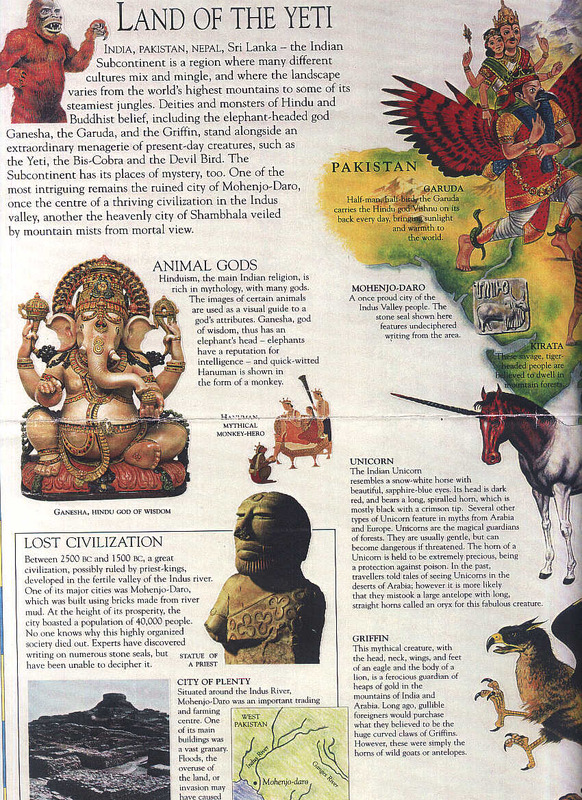 Hence it is a great pity that the remains reputedly found by Warren's grandfather were never examined by a qualified zoologist. After all, how often in modern times has science been presented with the skeleton of a mythical entity for formal scrutiny? The following winged wonder only became known to me in mid-October 2007, when Jan Patience, acting editor of the now-defunct British monthly magazine Beyond for which I contributed a major cryptozoology article each issue, brought to my attention a truly extraordinary email that she had just received from a reader. At that time, I was preparing a lead article on lesser-known British mystery beasts for the next issue of the magazine, so the email reached me in time for me to investigate it further and include a full account of the case in my article (Beyond, January 2008), and it is this account of mine that I shall now quote from here. "Back in 1969 I was 4 years old and travelling back from my auntie’s house in London. Dad had been driving for about half an hour and we were going through the countryside. I was in the back of the car when I suddenly heard an awful, screeching scream. Mum and dad were in the front chatting and heard nothing. It was twilight and as I looked out of the back window into the trees, I saw what I could only describe as a monster. 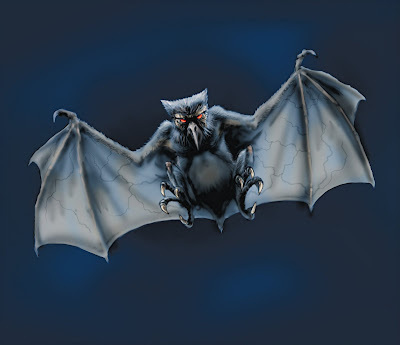 "It had bat wings which it unfolded and stretched out before folding back up again, red eyes and a kind of monster monkey face with a parrot's beak and was about 3 feet in height. "To my 4 year old mind it was terrifying and I had nightmares for weeks. 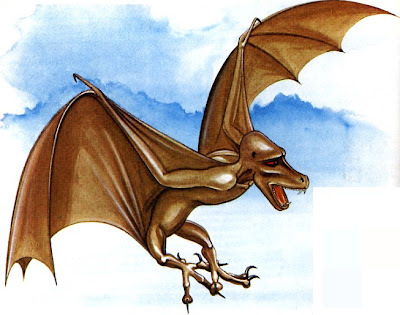 I did not have a name for this thing in my vocabulary and so called it The Bat Winged Monkey Bird as it seemed to be such a weird mixture of animals. "I saw it again late one night when I was eleven from the back window of the car on our way home from Hastings, I think we were travelling through Robertsbridge and I saw it for the third time last year. "It was 4.30 in the morning and I was woken by the same horrible screeching sound. Thinking someone was being murdered in the street I jumped out of bed and ran to the window, catching the tail end of it as it flew past. 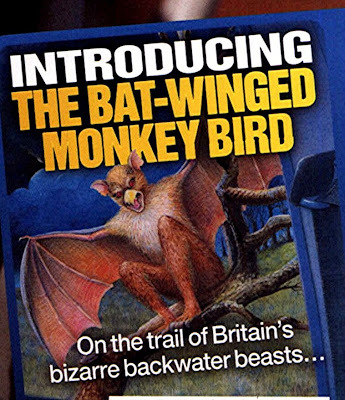 I knew immediately what it was. . .the same horrible monster thing I had seen all those years ago, The Bat Winged Monkey Bird was back. "I would be very grateful if you or any of your readers could shed any light on or put a name to this thing." When Jan forwarded Jacki’s email to me, I was naturally extremely intrigued, and replied directly to it, requesting any further information that Jacki could send. "My most recent sighting was at 4.30am on 19-10-06 outside my bedroom window, I saw the tail end of it fly past after the awful screeching noise woke me up, my address is in Tunbridge Wells in Kent. "The time before that I was on my way back from Hastings in Sussex, having just passed through Robertsbridge. While the first time I saw it, we were coming back from London, heading toward Kent and had been travelling for about 20-30 minutes. The creature was sitting in a tree in a field off to my right. "As for my parents, they just laughed and said I must have fallen asleep and had a nightmare; they weren't interested and simply dismissed it, even though I had nightmares about it coming to get me. "Although the creature looked solid flesh and blood and made an awful sound, I think it could be paranormal in origin as I have never seen or read about anything that even vaguely resembles it, but if it is real, I would love to know if anyone else has seen it." 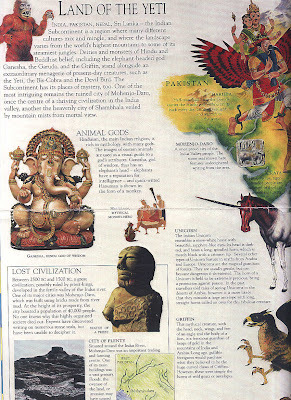 There is no doubt that this grotesque entity as described by Jacki does not correspond even vaguely with any known species of animal native to Britain. 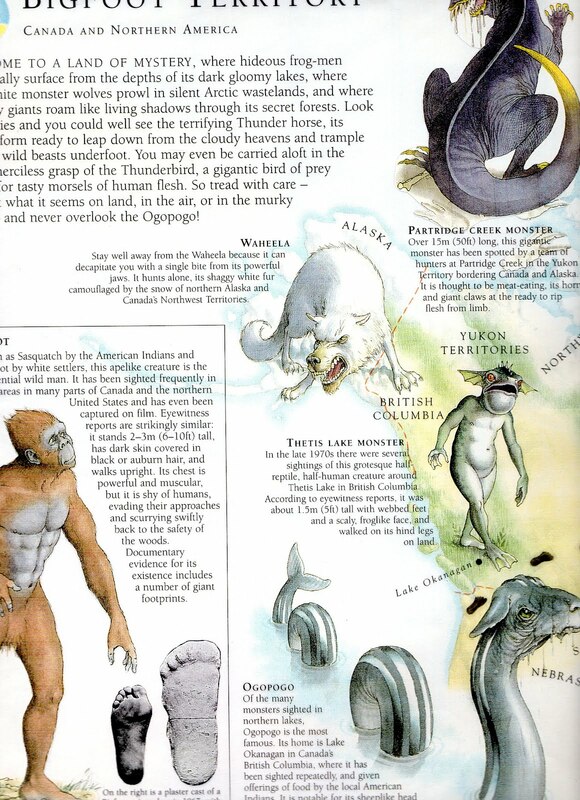 And even when venturing beyond the known into the realms of cryptozoology and zooform phenomena, there is little to compare with it, especially from the British Isles. Perhaps the nearest is the Cornish owlman, a weird owl-human composite spied in the vicinity of Mawnan Church Cornwall, mostly during the 1970s, and discussed later here. 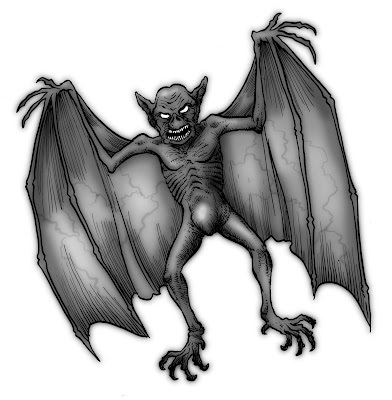 Remarkably, however, as I discussed in my Beyond article, Jacki’s creature is certainly reminiscent of the Raymondville man-bat(s), for which there has never been a satisfactorily explanation. "Sitting in his mother-in-law's backyard at Raymondville, Texas, on the evening of 14January 1976, Armando Grimaldo suddenly heard a strange whistling, and a sound that reminded him of flapping bats' wings - a highly pertinent comparison, as it turned out. 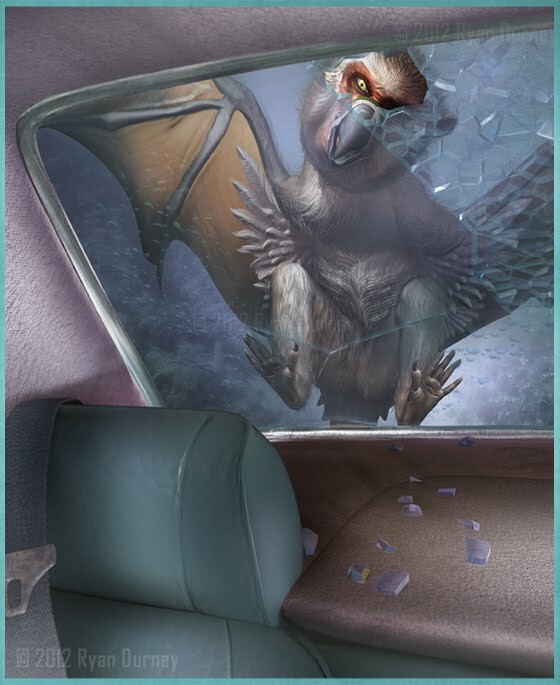 For just a few seconds later, he was attacked by a man-sized monstrosity with the face of a bat or monkey, a pair of large flaming eyes but no beak, dark, leathery, unfeathered skin, and a pair of huge wings yielding a massive 10-12 ft wingspan (i.e. twice that of any known species of bat). Swooping down at the terrified man, the creature snatched at him with its big claws, but, happily, Grimaldo was able to flee inside before his aerial attacker had inflicted any serious injuries. Nevertheless, his encounter was just one of several on file from this particular region of Texas during early 1976, all documenting sightings of a similar entity. "Another ‘man-bat’, 6-7-ft tall with a leathery 10-12-ft wingspan, clawed hands and feet, yellow eyes, well-delineated ears, and revealing a huge snarling mouth brimming with teeth, almost flew into the windscreen of a 53-year-old man, Wohali, as he was driving his truck (with his 25-year-old son as passenger) along a road near LaCrosse, Wisconsin, just after 9 pm on the evening of 26 September 2006. The creature then flew back up into the sky and vanished, but the shock of encountering it was such that both men became physically sick. They were convinced that it was a physical, tangible entity. 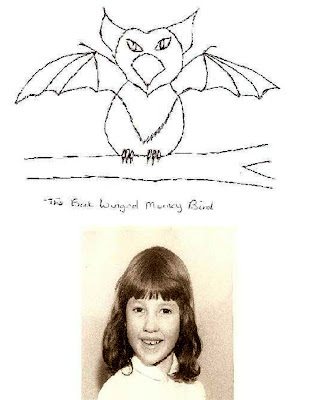 This remarkable case has been documented in detail online by Linda Godfrey at http://www.cnb-scene.com/manbat.html"
Returning to Britain's bat-winged monkey-bird: What is also very strange about Jacki’s report is that she saw the creature in three very different geographical localities and over a considerable period of time, yet without any other eyewitnesses apparently having seen it – or have they? This is where you, gentle readers, come in. Like Jacki, I would love to know if anyone out there has indeed seen this extraordinary creature, or something like it. So if you have, please get in touch with any details that you can provide. 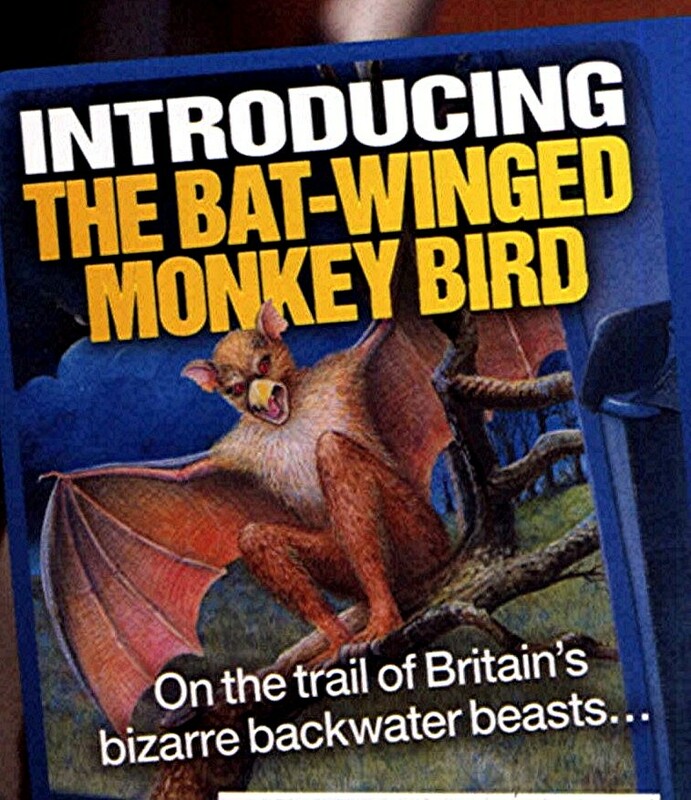 I now declare the case of the bat-winged monkey-bird well and truly open for online investigation! "On the 4th of September  one of these insects flew into a house near the Brunswick Brewery, Leeds. There was a sick child in the house at the time, and the mother, terrified at what she thought an evil omen, could not be pacified for some time. The insect was secured and taken to Wardman's, the bird-stuffer's." 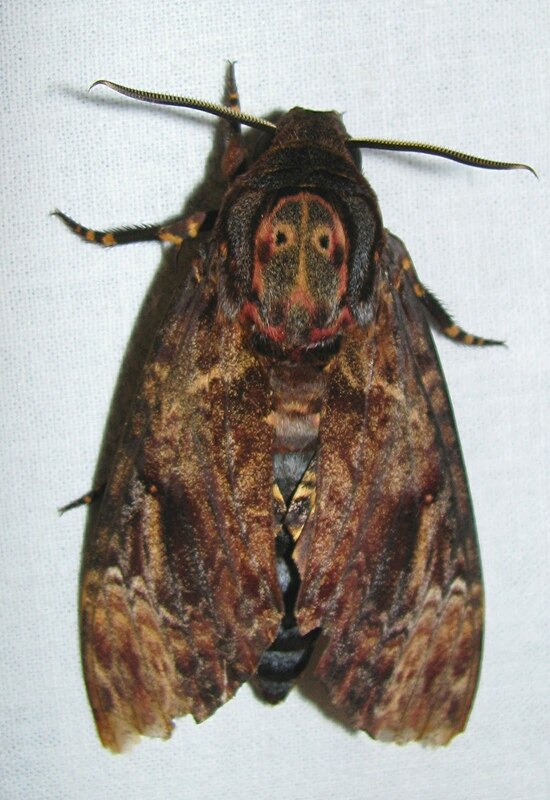 Acherontia atropos, the insect referred to above, is nothing if not distinctive in appearance. A rare migrant to the UK, with a wingspan that can exceed 5.5 in and a weight that can fall little short of 0.1 oz, it is incontestably Britain's largest species of moth. Its plum-coloured, wavy-lined forewings and rich golden-yellow hindwings, not to mention its bulky body striped boldly underneath in dark brown and primrose bands, also render it one of this country's most attractive moths. 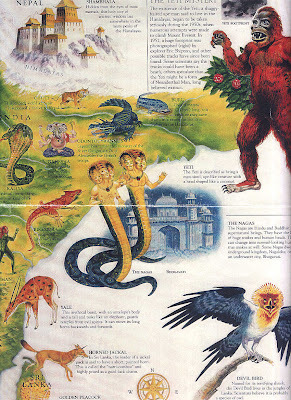 Nevertheless, all of these features are eclipsed by a single, but very singular, additional characteristic - one which instantly identities this species and distinguishes it from all others in Britain, which has woven around it a near-indestructible web of folklore and fear, and which has earned it its extremely sinister-sounding English name. This feature is a strange marking on top of its thorax's front portion, which, by a grotesque quirk of nature, forms a surprisingly realistic image of a human skull, ghostly white in colour with black, empty eyesockets. Enhancing this macabre image, the thoracic hairs bearing it are erectile, so that when they are raised up and down while the moth is resting, the 'skull' appears to be nodding! 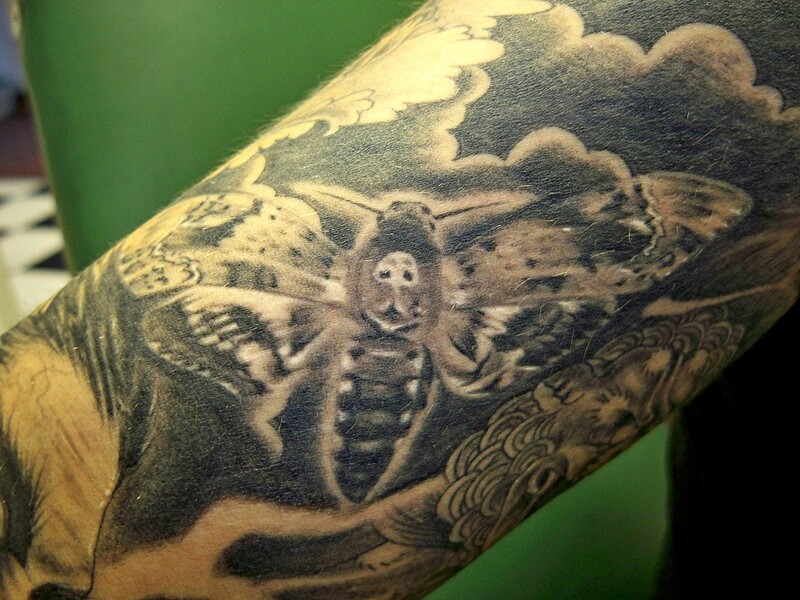 To many superstition-ridden people in the past (and even to some today) this bizarre insignia is considered to be nothing less than the symbol of Death itself, so that A. atropos is commonly referred to as the deathshead, or deathshead hawk moth in full. As can be imagined, its uncanny skull simulacrum has burdened this perfectly innocent insect with a fearful but wholly undeserved reputation as a harbinger of death, doom, and disaster, and has spawned a rich if ridiculous wealth of fanciful rural beliefs and old wives' tales. For example, on occasions when specimens have been observed in a given region just prior to an outbreak of an epidemic disease, the moths have been automatically blamed, and labelled as the messengers of impending mourning. Indeed, many people blamed the entire French Revolution upon the appearance of an unusual number of deathshead moths shortly before its commencement. Moreover, this insect is said in some localities to be in league with witches and to murmur into their ears the names of persons soon to be visited by Death. In central France, it is widely believed that blindness will result if dust particles falling from the wings of a deathshead in flight happen to land in the eyes of anyone watching it...and so on, and so forth. "I once saw a whole congregation checked while coming out of church, and assembled in a wide and terrified circle around a poor Death's-head Moth that was quietly making its way across the churchyard-walk. No one dared to approach the terrible being, until at last the village blacksmith took heart of grace, and with a long jump, leaped upon the moth, and crushed it beneath his hobnailed feet. I keep the flattened insect in my cabinet, as an example of popular ignorance, and the destructive nature with which such ignorance is always accompanied." Yet ironically, and despite its eerie thoracic emblem, this much-maligned species was not always so intimately associated in the human mind with death and ill-fortune. Its first English name, apparently given to it in 1773 by nature writer Wilkes, was much more pleasant-sounding - the jasmine hawk moth, after a favoured food-plant of its caterpillar. 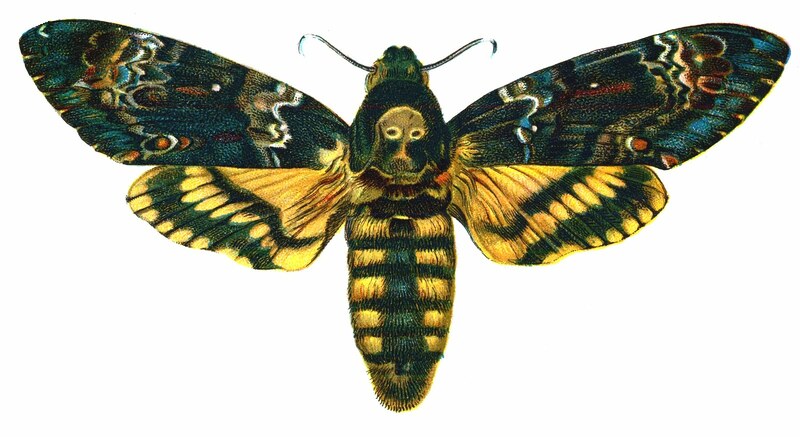 In 1775, Moses Harris renamed it the bee tyger hawk moth, because of its brown and yellow stripes. 1f only he had been content with this. Sadly, however, in 1778 he changed its name again, this time to the deathshead, which, to its great cost, it has retained ever since. Its scientific name is no less ominous either. Acherontia is derived from Acheron, a river in the underworld of Greek mythology; and Atropos, eldest of the Fates or Moirae, was the black-veiled goddess responsible for cutting every mortal's Thread of Life. 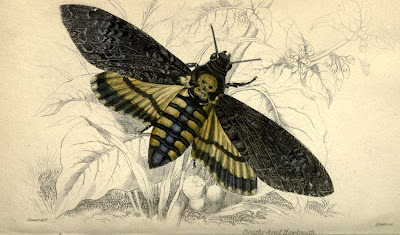 Acherontia atropos has two close relatives that share its deathhead motif and also have equally doomladen names. 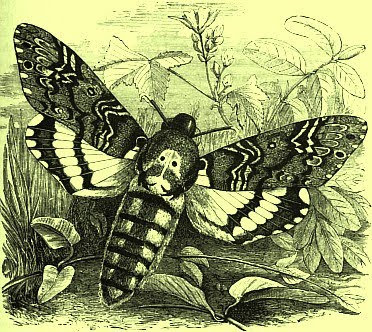 Acherontia lachesis (inhabiting the Orient and also the Hawaiian Islands) is named after another of the three Fates, this time Lachesis, who measures out every’s mortal’s Thread of Life, thereby allotting the length of their life. And Acherontia styx (native to the Middle East and eastern Asia) is named after the river of death encircling the Greek underworld. The tenacity of the deathshead’s fallacious notoriety as a winged memento mori has even attracted the attention of the entertainment world. In 1967, Tigon Productions released a UK horror movie entitled 'The Blood Beast Terror', which starred Peter Cushing among others, and concerned a Frankensteinian entomologist of the Victorian era who creates two humans with the ability to transform themselves into giant deathshead moths! This species is also associated with Salvador Dali’s macabre surrealist film ‘Un Chien Andalou’ (1929). 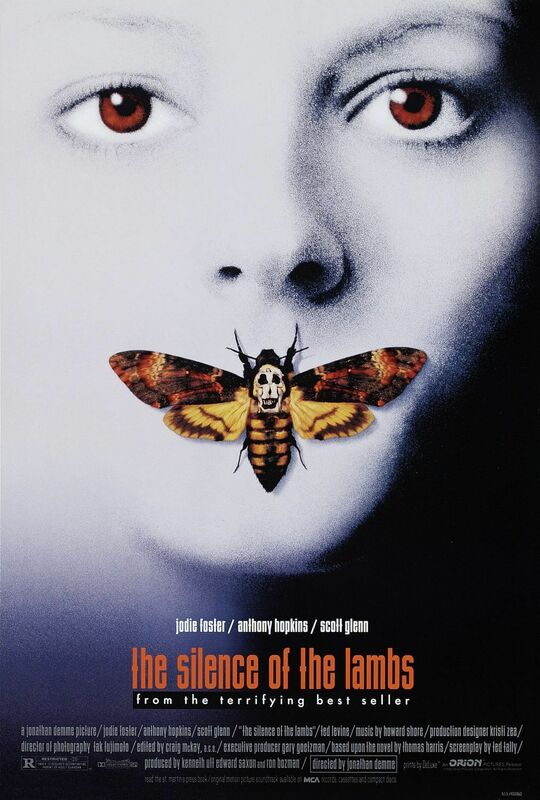 And it appears on the cover of Thomas Harris’s chilling novel The Silence of the Lambs (1988), as well as in the official theatrical release posters for the 1991 film adaptation starring Jodie Foster and Anthony Hopkins. Only a fairly rare spring and summer visitor to Britain, the deathshead A. atropos occurs as a breeding species throughout North Africa and the Middle East and northwards to the Mediterranean. It is resident in parts of southern Europe, and migrates throughout Europe - but cases of breeding have been reported on occasion from Britain, with discoveries of caterpillars in several southern counties. Up to 5 in long, and of robust girth, the impressive-looking deathshead caterpillar varies from several shades of green to lemon, dark brown, or even purple, and is embellished on each flank by seven mauve or azure chevrons, edged decorously with bright yellow or cream. This bold but beautiful colour scheme is topped off with a hazy sprinkling of deep violet or sparkling white dots, and as a final flourish its body's rear end bears a striking curved horn. 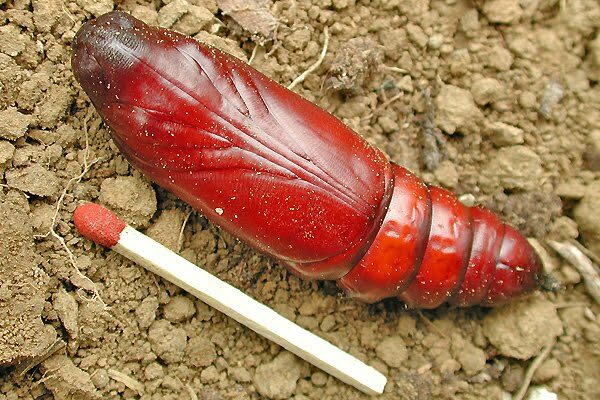 Pupation takes place underground, the caterpillar digging its way 2-4 in beneath the soil surface and transforming after about a fortnight into a hard, brown, somewhat shiny chrysalis, surrounded by its cocoon of soil, whose function seems to be to maintain the correct degree of humidity around the chrysalis for its successful metamorphosis. By late September or early October, metamorphosis is generally complete and the adult moth emerges. Sometimes two generations occur in the same year; the second emerges during November. "On the second floor of a house next to this zoological museum is a window whose wooden persienne have for a long time been closed. Though the shutters have been shut, the old wood was full of chinks, and Dr Hermes, the curator of the museum, noticed that a swarm of bees had utilised the space between the window and the shutters for a hive. Curious to see the work of the bees, on Oct. 1 he climbed up to the window, and was astonished to find it covered with death's head moths (Acherontia atropos). 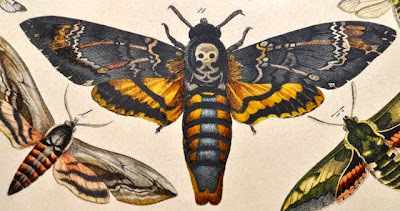 The moths, which are extremely fond of honey, had either failed to find their way out of the chinks through which they had entered, or, having fed too heavily on the food, had become dazed in the semi-dark light of the window. Dr Hermes and an assistant made their way into the room by another entrance, and removed a lower pane of the window. 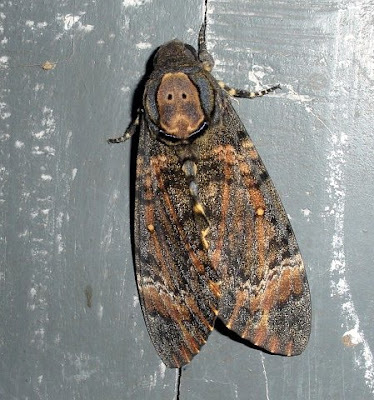 Quantities of moths were found hanging on the walls and others on the floor. Many that were dead had evidently been killed by the bees, which had got in under their wings, and those that were still alive were badly mutilated. More than one hundred large specimens were taken that day, and though every day five or six more were found in the same way, by Oct. 13, on which day Dr Hermes was summoned to Berlin, he thought that he had freed the last prisoner. 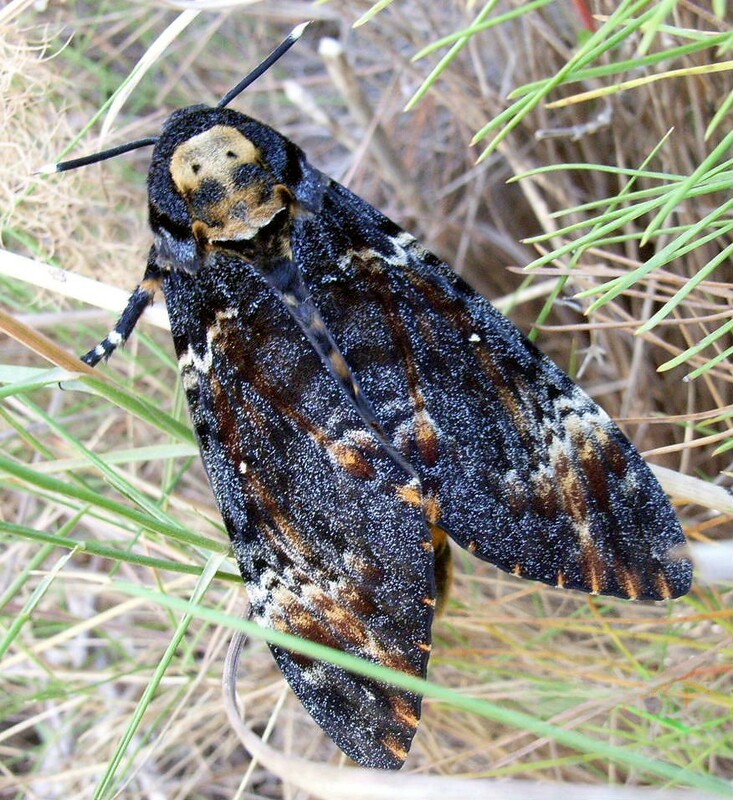 But a few days ago a telegram informed him that 154 moths had again fallen a prey to the bees." Its liking for honey also appears to explain a characteristic of the deathshead that is every bit as uncanny and superficially unnatural as its thoracic skull sign - namely, it has the highly unexpected and singularly unmoth-like ability to squeak! Records of this odd behavioural trait date back at least as far as the 1700s, and its physiological basis has incited much speculation. Some researchers assumed that the squeak was created by friction of the moth's abdomen against its thorax at the junction of these two body portions. Certain others suggested that it occurred if the moth's palps (accessory mouthparts) grated upon its proboscis. It is now known to result from the moth's inhalation of air into its pharynx, causing a stiffened flap (the epipharynx) to vibrate very rapidly. In their Illustrated Encyclopedia of Beekeeping (1985), Roger Morse and Ted Hooper report that the epipharynx's oscillation yields a pulsed sound of approximately 280 pulses per second for a period of about 80 milliseconds (80 thousandths of one second), followed by a brief pause of 20 milliseconds before the epipharynx is held upwards, enabling the air to be blown out - creating the moth's famous squeak. Lasting a mere 40 milliseconds, it is a very high-pitched sound of about 6 kHz - above the audible range of many humans, though children and acute-eared adults can usually hear it. The moth will perform up to six of these 'squeak-cycles' in as little as one second, but the squeak shortens as the moth tires. Naturally, there has been much debate about the precise purpose of the deathshead's squeaking. It is certainly a deliberate action, as the moth raises its body when doing so, which enables the sound to be carried to the bees through the air. And as the bees often react by permitting it to enter the hive unmolested (though its tough cuticle is sufficient to withstand occasional stings imparted by any less trusting hive workers, and it is in any case resistant to the venom imparted by such stings), it would seem that its squeaking serves as an effective password. Indeed, some researchers even assert that the moth's squeak is sufficiently similar to the sound made by the hive's queen bee to fool the workers into believing that their queen is instructing them to remain passive. According to this idea, therefore, the deathshead's squeaking is not so much a password as an inspired voice impression! Moreover, as revealed by R.F.A. 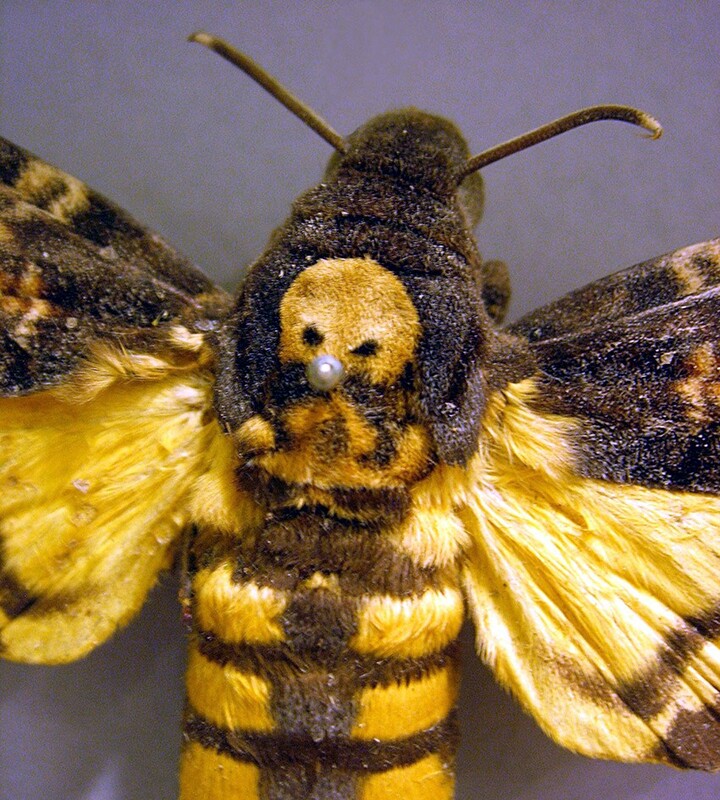 Moritz and colleagues, this extraordinary moth is even able to mimic the scent of the honey bees’ cutaneous fatty acids, thus rendering it chemically invisible to them, and so further enabling it to move about freely inside their hives (Naturwissenschaften, vol. 78, 1991). Intriguingly, writer and photographer Des Bartlett has discovered that in Kenya the presence of deathshead moths inside the beehives comes as a great shock to many of the native Kikuyu people, who seem convinced that they must be some form of wonderful super-queen bee (Animals, 30 July 1963). Also, their unexpected squeaking has been looked upon by all too many Westerners as something ominous or even preternatural - no doubt inspiring the earlier-mentioned myth that this species whispers into the ears of witches. All of which brings us back to the subject of superstition, whose anachronistic, irrational utterings of ignorance and fear are still inciting mindless acts of vengeance and violence against this very elegant, showy, and thoroughly harmless insect. Even though we have entered the ultra-scientific 21st Century, there are still people who will not hesitate to kill any deathshead hawk moth that they encounter, atavistically recalling foolish fancies from the centuries of the past. "In spite of its ominous livery, the Atropos does not come from Hades; it is no envoy of death, bringing sadness and mourning. It does not bring us news of another world; it tells us, on the contrary, that Nature can people every hour; that it was her will to console them for their sadness, to grant to the twilight and to the night the same winged wanderers which are at once the delight and ornament of the hours of light and of day. This is the mission of science, to dissipate the thousands of prejudices and dangerous superstitions which mislead ignorant people." 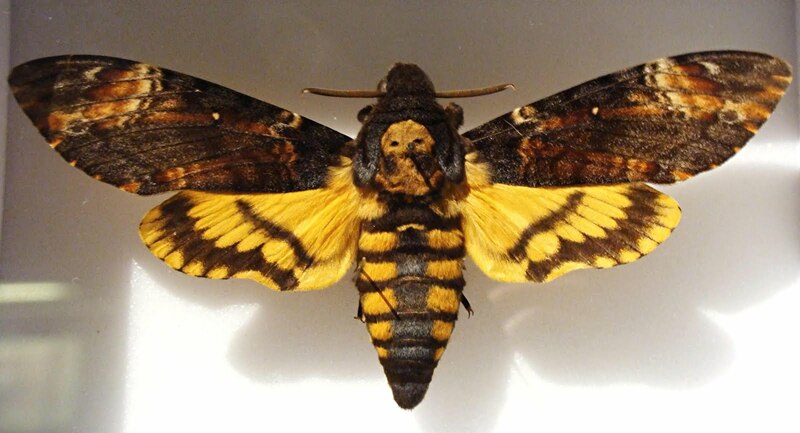 I pray that its mission will succeed, to ensure the survival of the deathshead hawk moth and every other animal currently endangered by the baneful influence of fatuous notions that should have been buried by rationality and compassion a very long time ago.